More and more, events in our world are being reduced to numerical values. We remember centenaries, we do things by percentages, we live our lives by a set of 4 numbers – the ticking digital clock. We are governed and informed by these digits, which prey on our lives in every way possible. Our time, our wealth, our friendships, our expression, are all caged by numbers. Indeed it is not particularly hard to see the absurdity of human existence when it is us who imposes these restrictions on our own selves from cradle to grave. We limit ourselves, with the sting in all this being that we limit our own natural selves more and more through completely artificial values. Numbers and equations, the things that govern our lives, our universe and our well-being (think of the graph on the hospital patient’s bed) are completely artificially imposed constructs. Firstly, I posit that numbers are artificial. By this I mean that they are not concrete in meaning or value – if I have a pen, it is physical. I have a pen in my hand and, without resorting to Cartesian scepticism, you cannot disagree. Numbers themselves are contingent on two things – firstly, a physical object or objects, secondly language itself. Take seven. I can have seven pens, let’s say. That seven is a representative of the value of pens I have. Yet I cannot have a pure seven – that is impossible. Seven must relate to something else. Indeed if seven does not relate to something else, even the term ‘seven’ is null and void – seven what? The same goes for all numbers- they are all contingent on physical objects, and thus language, to carry their value. Without physical or imaginary representation, they are worthless even in terms of language. For to talk of a pure seven in itself is an absurdity that would be dismissed if it came from the mouth of a toddler as babble. You can retort by saying that nothing is really physical – language and all other meanings are assigned. Yet to live according to this theory is impossible. Some things, like language, must gain clear meaning from what we assign to them in order that we function normally. Numbers cannot gain any clear, distinct meaning from what we assign to them, again as the problem of the concrete seven reappears; The most we can do with numbers is simply work in terms of binary and multiples. 0, 1, and then the indistinct Multiple. Having laid the foundations, the building now must be started. 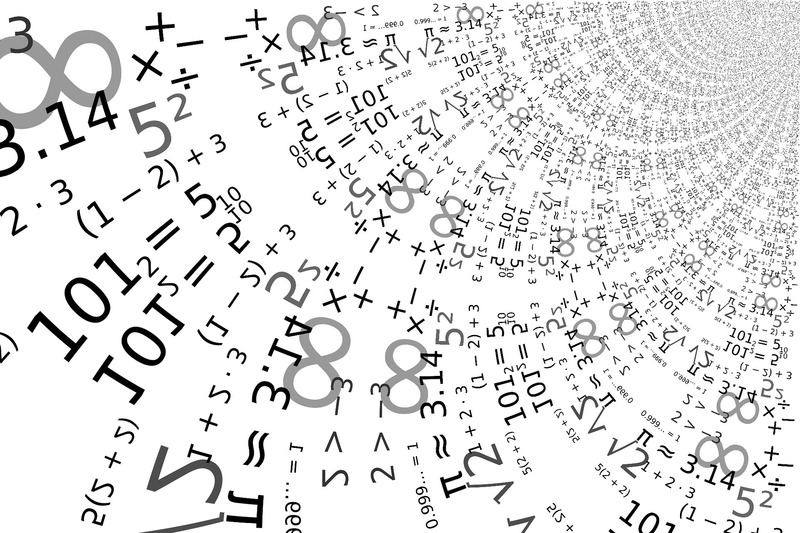 Although numbers do not relate to the physical world in their purest sense – we relate them to the world – they are used more and more to describe the physical world we live in. The boundaries of this are being tested. A car crash is described in Newtons, the force calculated by multiplying mass and acceleration according to Newton’s Second Law of motion. Our expanding universe right down to the activity of our brain is reduced to a series of mere numbers and equations. Our lust for empirical, scientific knowledge has taken us to a point where we are only satisfied with scientific proofs and we have lost our powers of reasoning and imagination. For to measure a car crash in an equation and not in human life takes away the humanity of the incident – the equation replaces the living, breathing flesh of the accident. It places a value on the incident, imposing a hierarchy of suffering, a measurement of pain. It is not hard to see the consequences of this algorithmic, numerical society. Our human moral values, our empathy, our humanity itself, could be swept away by our own created numerical values. In future, we will measure pain by numbers. We cannot allow numbers to dominate our morality and our thinking. Machines work in binary, in ones and zeros – basic numerical values. What happens when a self-driving car gets in to a situation where it has to kill one person and save another? It will happen at some point – a machine, run by numbers, incapable of morality, will have to assign numerical values to human life. This is essentially eugenics – a life will be ended and a life will be saved based on an artificial value implemented by humans on humanity. We are on the path to a morality of machines, a number-based value system where one life is worth 2.5 and another is only worth 0.3. To continue down this road would be to create a fundamentally unethical society. Machines operating off numbers making key decisions in our everyday lives poses an existential threat both to human liberty (by which I mean liberty in the positive sense, the obedience to our own self-assigned laws) and to human morality. What need is there for a judge, what need is there for subjectivity, in an age of ones and zeroes and a misguided faith in our own invention – the distinct numerical value?